Photo Credit UNHCR: Tens of thousands of Rohingya Muslims have fled Rakine state in Myanmar seeking refuge in Bangladesh to escape the brutal, murderous attacks of the Myanmar military, police, and hate-filled Buddhist mobs. The Rohingya Muslims have been deemed by the UN as the most persecuted people in the world. A United Nations (UN) human rights investigator says up to 10,000 civilians have been forced to flee their homes in Myanmar’s northwestern state of Rakhine since November last year as a result of continued violence and a lack of humanitarian aid due to government restrictions. Yanghee Lee, the UN’s special rapporteur on human rights in Myanmar, made the revelation on Monday, March 11, calling on the UN Security Council to refer Myanmar to the International Criminal Court (ICC) over its atrocities against Rohingya Muslims and other ethnic minority groups in the conflict-ridden state. Thousands of Rohingya Muslims were killed, injured, arbitrarily arrested, or raped by Myanmar’s soldiers and Buddhist mobs mainly between November 2016 and August 2017, when the surviving members of the community started fleeing to Bangladesh en masse. The United Nations has described the Rohingya as the most persecuted community in the world. 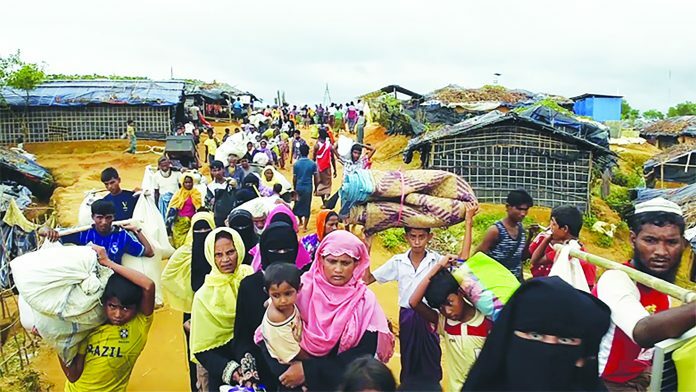 Partly because of the poor conditions in the camps, and partly because of the prospect of repatriation to Myanmar, the Rohingya Muslims have occasionally attempted to flee Bangladesh. Bangladesh is currently hosting more than one million Rohingya Muslim refugees who have fled Myanmar’s deadly army crackdown and persecution since 2017. The government in Bangladesh has for long been pushing a controversial plan to relocate thousands of Rohingya refugees to an isolated and flood-prone island in the Bay of Bengal, where they may be stranded forever. The UN official paid a visit to the island in January. “I had the opportunity to visit the island on my last visit to Bangladesh and saw with my own eyes the works that the Bangladesh government has undertaken. However, there are a number of things that remain unknown to me even following my report, chief among them being whether the island is truly habitable,” Lee told the UN Human Rights Council on Monday. “Ill-planned relocation and relocations without the consent of the refugees concerned have the potential to create a new crisis. It is incumbent on the government of Bangladesh to ensure that this is not brought about,” she added. Bhasan Char, whose name means “floating island,” emerged from the silt about 20 years ago and is located about 30 kilometers from mainland Bangladesh. The island is flat, shape-shifting, and inundated by regular floods during the months of June and September every year. Humanitarian groups and aid workers have on numerous occasions lashed out at the relocation plan, saying the island is vulnerable to frequent cyclones and cannot sustain the livelihood of thousands of people. In a separate development on March 11, a Myanmar woman who lost her husband in the latest deadly attack by Buddhist rebels in Rakhine called on the army and militants to lay down arms, halt the violence and start peace talks. Myanmar’s armed forces are currently engaged in a conflict with the Arakan Army (AA), a Buddhist rebel group calling for greater autonomy for Rakhine. During a recent attack in the northwestern state, nine people were killed and Ma Oo Khin’s husband was among one of the victims. The area has been on strict lockdown since the attack. The Buddhist rebel group conducted raids on police border posts on January 4, killing 13 people. The clashes have added a new, complex dimension to the troubles in Rakhine, which has been the scene of communal violence since 2012.